The initial role of the shoulder straps was purely utilitarian. They served for attaching to the shoulder straps ammunition bag or bag-pack. And because the shoulder straps were only one and only the rank and file. Officers shoulder straps were not. Gradually army ammunition changed. In the late nineteenth century the utilitarian function remained, but the straps have already served to distinguish between soldiers and officers, as well as to determine the belonging to a regiment or division. Since 1943, shoulder straps only serve to distinguish ranks. The average composition is on the shoulders epaulettes of red. Serving in airborne units, air force and space forces blue. The sailors shoulder straps in black. On field uniform the shoulder straps are removable, camouflage color. On them there are no distinctions. Belonging to a NCO is determined by the presence of lacek. Insignias — strip in the form of cloth braid. For dress and casual form stripes of yellow color on field — protective. The first rank — corporal. The distinction is one narrow cross insignias. Sergeant is on the shoulder straps two narrow transverse stripes. Sergeant — three. On the shoulder straps of the staff Sergeant — one broad cross insignias. And finally, the foreman on the shoulder straps has one large longitudinal insignias. The next band warrant. Their shoulder straps very similar to the officers, but without gaps. Shoulder straps of green, casual and dress uniform, the edges of the narrow red piping. In aviation, space forces, and airborne Kant blue. On the shoulder straps of the ensign — two little metal stars, arranged vertically. The senior warrant officer three. The officers in dress uniform epaulettes Golden in color, on the daily green, the summer white shirt — white. On field uniform the shoulder straps are removable, camouflage color. With the rank of second Lieutenant starts Junior officers. Their epaulettes decorated with a narrow vertical stripe, clearance, and small metallic stars (13mm). For everyday and dress the star of the yellow metal, and gleam red or blue. On the field uniform is no clearance, stars green. The younger lieutenants one star, located in the lumen. Lieutenant — two on each side of the lumen. Lieutenant is on the shoulder straps three small stars arranged in a triangle: two on the sides of the lumen and the lumen is slightly higher. The captain of four stars: two clearance and two on either side of him. The next group of senior officers. On the shoulder straps — two narrow lumen and large metal stars (20 mm). The colours are the same as for the younger officers. The major on the shoulder straps one star. Lieutenant Colonel — two, at each clearance, the Colonel three two gaps, one in the middle, placed in a triangle. The senior staff is in uniform, wearing a large embroidered stars (22 mm), arranged vertically. There are no gaps. From major-General one star, Lieutenant General — two, Colonel-General three. If the shoulder straps four embroidered stars in front of you General of the army. The highest military rank in the armed forces of the Russian Federation Marshal of the Russian Federation. His uniform one very large embroidered star (40 mm) and the coat of arms of Russia. 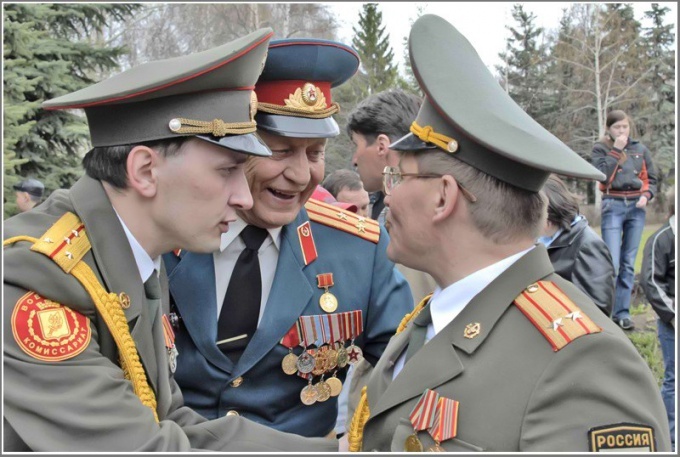 This type of shoulder straps of the Russian army determined by the presidential decree No. 293, dated 11 March 2010. Its full name "On military uniforms, the enlisted rank insignia and departmental insignia".